After our breakfast we depart northwards towards Delphi, which used to be the most sacred place in the world and a pilgrimage center for many centuries in antiquity. You will admire the Sanctuary of Apollo, walk the Sacred way, and visit the temple of Apollo, home of Pythia (the oracle). In the afternoon, and after a short break for lunch (not included) we will be crossing the mountains of central Greece to arrive in Kalambaka for dinner and overnight. The day is dedicated to exploring the city of Athens. We begin with a panoramic tour to the most important monuments and landmarks of the city including the Panathinaikon stadium, the Zappeion, the temple of Olympian Zeus, Hadrian's Arch, Syntagma square, the Parliament, the tomb of the unknown soldier, Schliemann's house, the Academy, the University, the National Library, and the old Parliament. Next we head for our guided visit to the Acropolis, including the Propylae, the temple of Athena Nike, the Parthenon, the Erechtheion. Later, we continue with a guided visit to the Acropolis museum voted one of the best museums in the world. After some free time to explore Plaka, the picturesque old part of the city, you will be transferred to the port to embark on "Celestyal Cruises" for your 7-night "Idyllic Aegean" cruise. Arrival in Mykonos early in the morning. You will have a whole day and a whole night to explore the favorite island of the international "jetset". Enjoy one if its unique beaches during the day, follow an optional excursion to Delos, and make sure you explore the bustling night-life of the island. We set sail early this morning and just after mid-day, we will be arriving at the unique island of Milos. Spend the rest of the day exploring the magnificent island with the unique morphology and the unparalleled beaches. This morning we will be arriving at most famous island of the Aegean, Santorini. The ship will be staying here for two whole days giving you the opportunity to explore the amazing beauties of this island and its life. During your included shore excursion, you will visit "Oia perched on the Caldera rim", but you will have plenty of time to explore other sites of this amazing island and the volcano, either on your own or by joining other optional excursions. Arrival in Heraklion early in the morning where we will stay until the evening. During your included shore excursion to the Palace of Knossos you will have the opportunity to learn all about the Minoan civilization and the legendary Minotaur. In the morning you will be arriving at port of Kusadasi in Turkey. Disembarkation for your included shore excursion to "Ancient Ephesus through the Ages". Return on board for the overnight sail back to Piraeus. Arrival at Piraeus port in the morning. Breakfast on board. Disembarkation and transfer to the Athens airport for your departure. Selected Fridays from April 19th until October 11th. 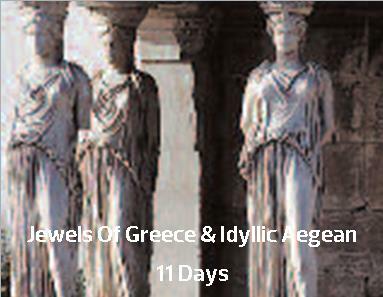 The 2-day Delphi-Meteora tour on SIC, on half-board basis (breakfast and dinner). The 7-nights "Idyllic Aegean" cruise, including all meals, drinks package, port & services charges, tips/gratuities on board, and the above mentioned 3 shore excursions.